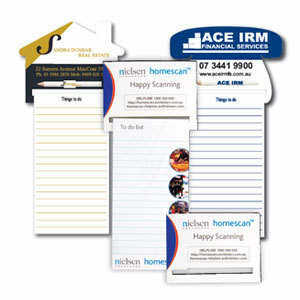 What a great way to leave messages in the home or office and promote your brand to customers. These magnetic to do lists come with a 25 page note pad that can be custom printed to your requirements so you can have your brand, message, logo and contact details on full show and you will be remembered. The magnet shapes include a Van, House and Telephone which will suit most businesses. Lead times are for in-house standard pad only. Variable-data printing (VDP) available for an extra cost. This can include printing individual names on each list. Great for personalised marketing campaigns. 4 Colour Process: 200mm x 100mm (Printed 2 sides). Variable Data: 200mm x 100mm (Printed 2 sides).